So, before rambling on about holidays and how the Summer has been, I wanted to share a post about a lady who was one of my biggest supporters throughout my entire life. My Nan. Marjorie Crawford. At risk of her not being happy about me writing about her in the public domain, I just wanted to share a few thoughts about her and the part she has played in my life. My wonderfully honest, caring, intelligent, open minded yet old school Nan passed away on 14th August, aged 95 years old. I was away in Jersey and so did not know until I returned. It was a hard decision for certain family members to not get in touch to tell me and I appreciate their decision to just wait until we were home 2 days later. My initial reaction was surprise; I really wasn't expecting her to go! At 95, I think I had somehow convinced myself that that meant she'd never die. She was such a strong lady. But my consolation was that it was sudden and painless for her and so she would have felt no fear. During my life, and particularly in my teenage years, I had some difficult times. And sadly, some of those times I couldn't get the emotional support I needed from my parents or siblings. My Nan did not hesitate in showing me that she would always be there for me and she would always believe in me and what I am. She whole heartedly trusted me and never once failed to let me know that she loved me. Don't get me wrong, Nan didn't announce her undying love every five minutes, she wasn't like that. But just for the way she always listened to any problems I might share and of course, offer her advice. Nan was sad that Max had so much to go through in life and she would often tell me how sorry she was that there was nothing she could do to change that situation. I know she found it heartbreaking at times, but in good old Nan style, she never showed her upset. I thank God that Max had the opportunity to have a good, close and strong bond with his Great Nan. There’s not a lot of kids out there that get to have that chance. Nan was very proud of him. My Nan was one of my closest friends and confidantes and she loved to hear stories about my bunch of idiot cats. 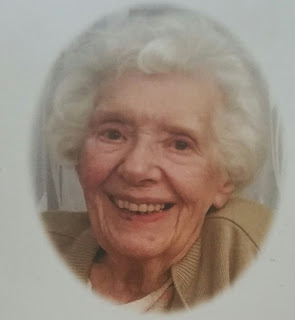 We did have some good laughs during our phone calls and on days that we managed to visit her in the care home, we still managed to get a bit of fun and mischief in. I had the utmost respect for her and I will always think of her with a smile. I will miss her greatly. "try not to make imbecile remarks"